Action: Choose a character. That character gains (T)(C)(A) until the end of the phase. 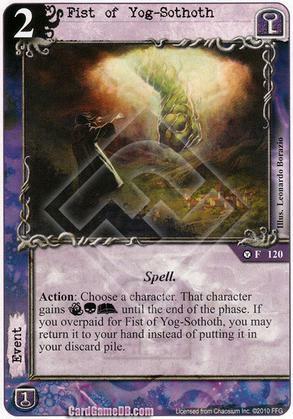 If you overpaid for Fist of Yog-Sothoth, you may return it to your hand instead of putting it in your discard pile. Action: Choose a story in which you have 2 or fewer success tokens. 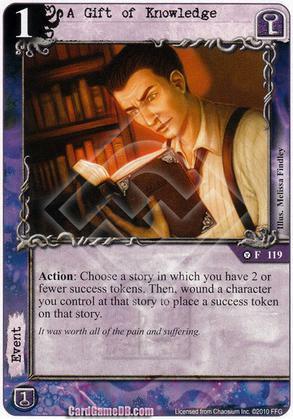 Then, wound a character you control at that story to place a success token on that story. It was worth all of the pain and suffering. Action: Choose and destroy a wounded character. The quarry of the Elder Gods eluded them only briefly. 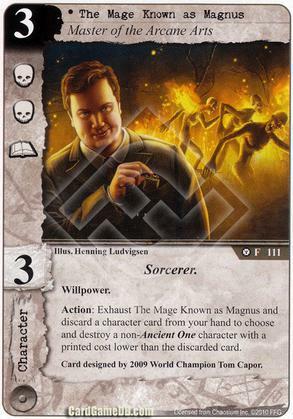 Action: Exhaust The Mage Known as Magnus and discard a character card from your hand to choose and destroy a non-Ancient One character with a printed cost lower than the discarded card. 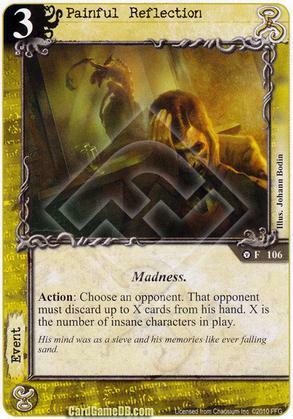 Card designed by 2009 World Champion Tom Capor. 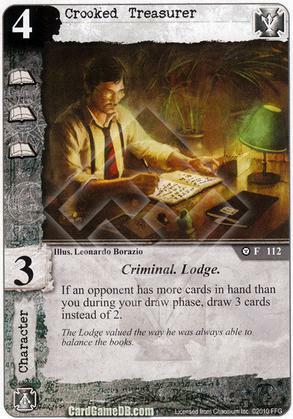 The Lodge valued the way he was always able to balance the books. 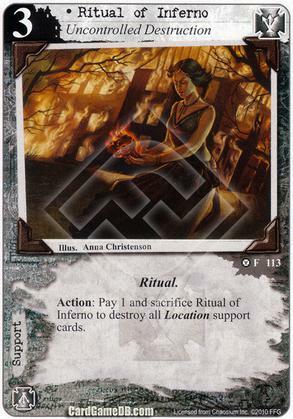 Action: Pay 1 and sacrifice Ritual of Inferno to destroy all Location support cards. The evil-doer heads the wicked tongue. 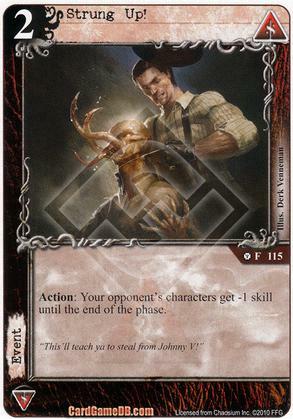 Action: Your opponent's characters get -1 skill until the end of the phase. "This'll teach ya to steal from Johnny V!" 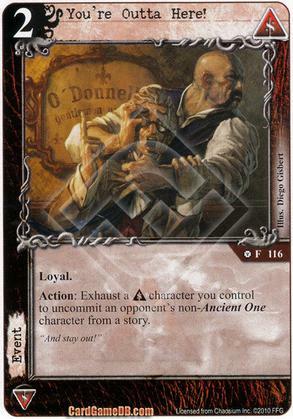 Action: Exhaust a Syndicate character you control to uncommit an opponent's non-Ancient One character from a story. 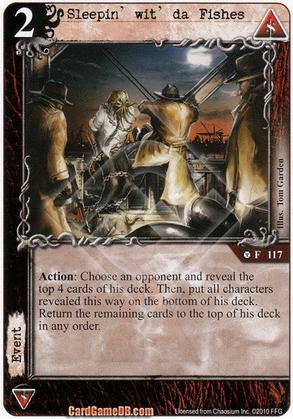 Action: Choose an opponent and reveal the top 4 cards of his deck. 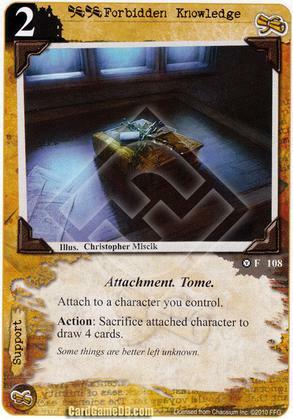 Then, put all characters revealed this way on the bottom of his deck. 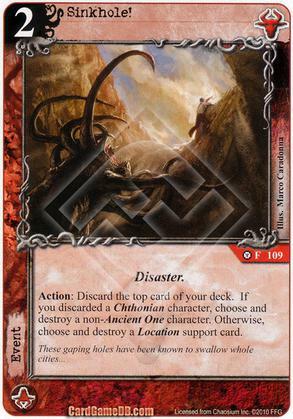 Return the remaining cards to the top of his deck in any order. 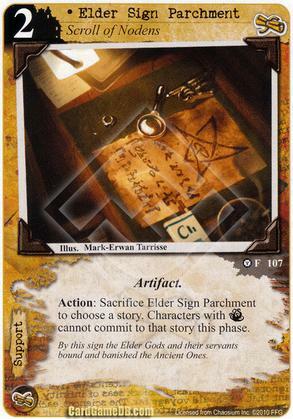 Action: Sacrifice Elder Sign Parchment to choose a story. 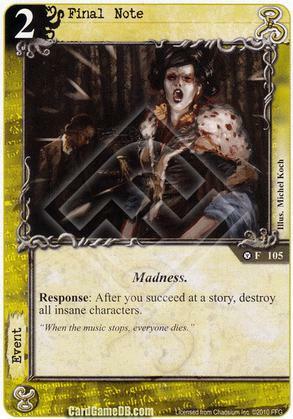 Characters with [Terror] cannot commit to that story this phase. By this sign the Elder Gods and their servants bound and banished the Ancient Ones. 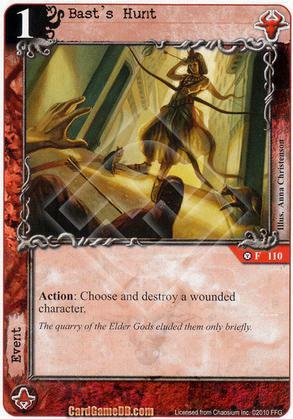 Action: Sacrifice attached character to draw 4 cards. His mind was as a sieve and his memories like ever falling sand. "When the music stops, everyone dies." 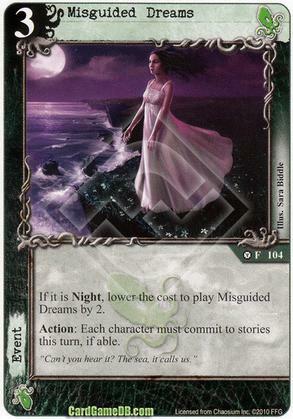 If it is Night, lower the cost to play Misguided dreams by 2. 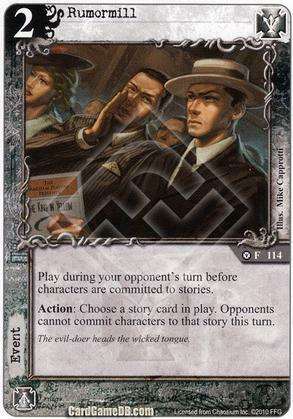 Action: Each character must commit to stories this turn, if able. "Can't you hear it? The sea, it calls us." 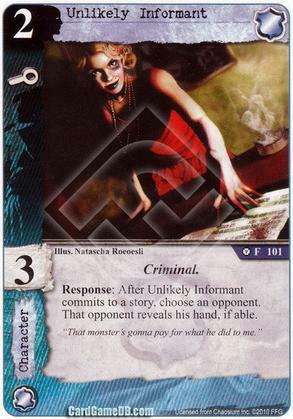 Response: After Unlikely Informant commits to a story, choose an opponent. 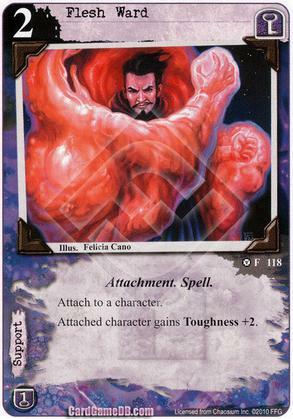 That opponent reveals his hand, if able. "That monster's gonna pay for what he did to me." 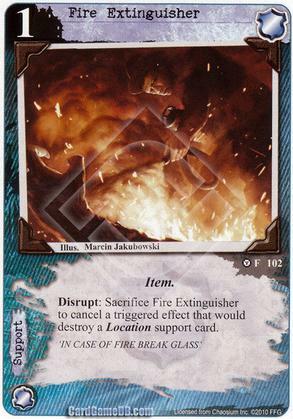 Disrupt: Sacrifice Fire Extinguisher to cancel a triggered effect that would destroy a Location support card. "I don't know what happened, officer. 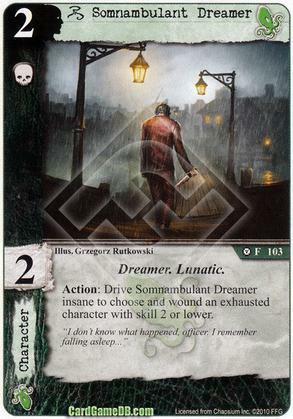 I remember falling asleep..."